China Isotope & Radiation Corporation, a company affiliated with China National Nuclear Corporation (CNNC), signed a strategic partnership deal with Accuracy, a US radiotherapy company in the northern Chinese city of Tianjin, on Jan 28. The two have agreed to set up a joint venture specializing in the manufacturing of radiation oncology systems. Radiotherapy is a proven and effective method of treating cancer and other life-threatening diseases. The agreement between the two industry-leading companies aims to solve technical problems associated with delivering radiotherapy, and develop new methods to treat Chinese cancer patients. China Isotope &Radiation Corporation is the country’s largest manufacturer of diagnostic imaging and radiopharmaceutical products, while Accuracy boasts cutting-edge radiation oncology technologies. 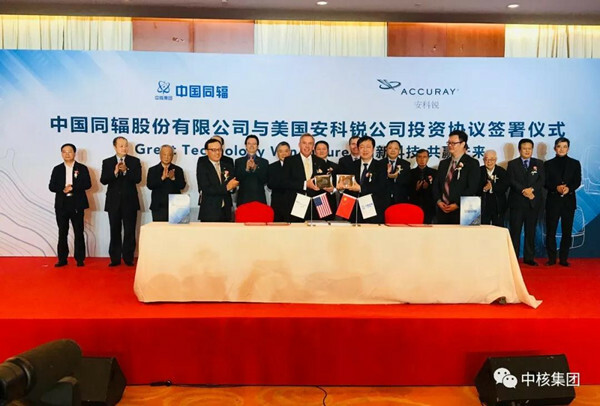 By leveraging the strengths and capabilities of both companies, the joint venture CNNC Accuracy (Tianjin) Medical Technology Co Ltd will be able to boast a competitive edge through its locally branded and manufactured innovative radiotherapy products.